Residential building Kateřinky C, which is part of the residential complex Na Křtině, is located in Prague 11 - Újezd u Průhonic, in the street Na Křtině. It is a quiet residential area in the immediate vicinity of the protected area Milíčovský Les (Milíčovský forest), which offers space for relaxation, sport and is perfect for walks in the countryside. This place is also connected through a pleasant footpath through the Milíčovský forest and along the creek Botič with the park in Průhonice. Nearby is also a water reservoir Hostivař. The location is also very easily accessible by public transport and with good civic amenities. Metro C station Háje is within walking distance of approximately 20 minutes. The new building is located close to the kindergarten, primary school, secondary school, health center, shopping centers and sports facilities. For this reason, these apartments are suitable for families with children. In the new proposed three-story building there are 12 flats. The flat units on the ground floor have a garden and to the two flats on the 3rd floor belongs a large rooftop terrace, for the most part designed as a green roof garden. Landscaping will be part of the green areas design and will include seeding grass and planting of shrubs. A natural part of the house is a lift and cellars for housing units. On each floor there are four apartments, in the basement are garages, cellars and technical facilities of the house. Each apartment has a parking space. 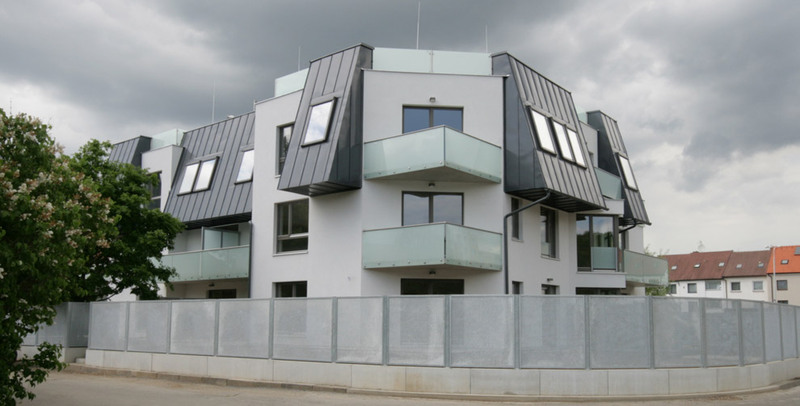 The construction of residential house began in the summer of 2014 and follows up on the successful construction of houses in Prague 5 - Lipence and a multifunctional building in Průhonice. Expected completion date is 12/2015, as the contractual completion date we specify 05/2016.